I would supply more photographic evidence of Carreto but after going to check-in and ask the chief/Silas if we could stay, ohh and part with the manditary $5 otherwise known as 'Kuna Tax', we where then told, "Carreto is not a tourist town and wishes to remain this way". All very cool with us as we know culture in the San Blas is rapidly ebbing away, we just felt lucky to see it. There are 5 silases in Carreto and we had the pleasure to meet two, but we were then restricted to only walking the streets and be back on our boat by dark. Before the village meeting each night which starts at 6, we understand this is when the village elders lye in the centre of a large community meeting hall with the village folk sitting all around on benches, this too is in order of importance, women and children first then the rable of men pushed toward the back of the auditorium. This is where the Stories of old and all community issues and concerns are discussed and like all good communist states it is the 5 boys and the top luxuriating in the hammock that make any rulings. We are beckoned into the Sylas hut by an old toothless lady in traditional dress and enter into a cavonous dark room, with a about half a dozen women sitting about on low stools, and swinging from the bamboo rafters 10 dozen mola tops, there we are ushered towards the sick boy who is swinging on his hamock in the baking heat with a blanket over him and Kuna herbs strung above him in order to ward off spirits and virus. The next Silass we visited we where about to provide this old man with diaretics and I had to give the grandma of an indeterminable age ransid feet infected feet, it seems bizar to be giving some one of this age a lesson on how to clean a wound and cover it so as not to reinfect. We had been told that alot of Kuna Indians especially those in the eastern more remote villages, had little to no access to things we count as normal human needs, things like reading glasses, medicine, clothing for babies, they might have a two shops in the village selling all things you need to make a flipping mola (it is law that ladies wear traditional dress) but any pain releif or sanitary towels for women. We are ambushed by every lady once word is out we are trading but not just trading we are only interested in old used molas, by the time we leave we come way with no reading glasses of which we had a 11 and we are now the proud owners of 8 really dirty threadbare faded bits of cloth, ohh and a bunch of plantain and 5 little fish. But the marouding crowds were quite an experience, but not sure we will be repeating our second approach to intergrating with the indigenous folk. The kids where now rather nervous of our visits on to land. And whilst Cosmo ( now known as Cosman) enjoyed the endless footy and basket ball games in which he was conciderably lacking when playing with the local boys. It was a great village and really well maintained. Dispite being very cut off from any form of running water, light all the villages seem to have a few Telephone quiosks,but inkeeping with the design of the village these boxes are disguised by bamboo walls and palm frong roof. Because there is no mobile reception down here they use the telephones to keep in touch with friends and family in other parts of Kuna Yala or in Panama. 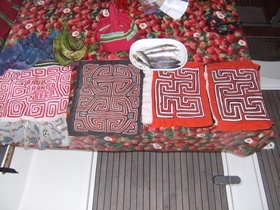 This is efficiently done by ladies working shift work and mola stiching whilst watch the phones, and when they ring a local youngster will dash off and find the required village member. But i just love the fact they cover these ugly plastic blue boxes up. Carreto was beautiful and an extremely peaceful place if you don't try and trade for crappy old molas.